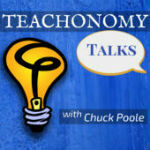 106: Thoughts for Teachers: What Kind of Pilot Are You? Today's thought is this: What kind of pilot are you? As teachers, we have the opportunity to guide our students much like a pilot guides the passengers sitting on his or her plane to their destinations. The trip along the way may be bumpy at times, but the experiences overall will be determined by how the pilot handles the plane. How do you handle the passengers on your plane each day? Let's talk about it.